Veneers are a thin, translucent coating made out of porcelain or composite. They are applied to the front teeth to improve their color, shape or size. Teeth that are discolored from medication or age, crooked teeth, gaps and spaces or worn and chipped teeth are all problems that can by corrected with veneers. Veneers are an easy way to help you achieve the smile you want. Veneers may require 2 - 3 appointments. Your dentist will examine your teeth and discuss what kind of veneers will be most beneficial to you. The enamel of the tooth is reduced and then a mold is taken of the tooth and sent to a lab to be made. Next, the veneer is bonded to the tooth, and the cement is hardened. 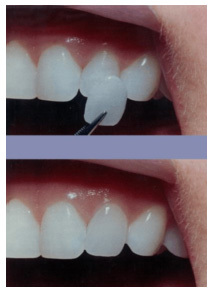 The finished veneers should be comfortable and a match to your existing teeth. Veneers can help you have a better looking smile. But be sure to practice good oral hygiene and have regular dental checkups. This will help keep your teeth and gums healthy.